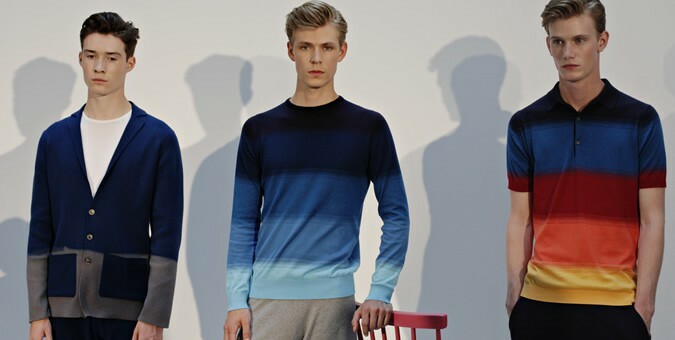 John Smedley was one of 22 brands opting to showcase its latest range with a static presentation at this year’s London Collections: Men. The line, titled ‘Spring Fever’, delivered several nautical pieces at the space on Endell Street in the capital. Basics made up the majority of the collection, with t-shirts, joggers, polos and shorts all coming in a selection of sea-inspired colours and Breton stripes. Meanwhile, the fisherman knit was given a modern makeover with a new micro-texture finish. Sailing was referenced with prints and fabrics, including a micro-wave pattern on granddad collar tops. To celebrate 100 years of production at its mill, the brand developed a new dying technique used to create an anti-graduation effect. Every item created using this process is individually dyed, making each unique. Models were grouped together standing on platforms and individually next to rails of the new products. Among those helping to display the line was 17-year-old Canadian Connor Paterson, in his debut fashion week season. John Smedley SS15 will be available from December this year at stockists including Selfridges, Harrods and Mr Porter, as well as online from johnsmedley.com. Images by Daniyel Lowden exclusively for FashionBeans. The Best Made In Britain Shoe Brands A complete guide to the kings of the cobblers The Burpee Workout That'll Shred Fat Fast It's tough, there’s no two ways about it How To Wear A Belt With A Suit Tailoring sin or underused menswear hack?